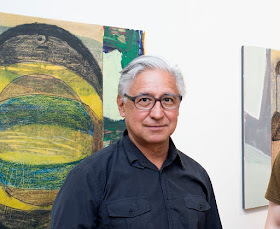 La MaMa Galleria is pleased to present Introductions, curated by New York-based painter Roberto Juarez. For this exhibition, Juarez and eight of his colleagues will each introduce an artist of their choosing to the gallery. The show focuses on visual and spatial conversations between artists working at different stages of their careers, and through this contrast mixes genres and ideas. Some of the artist pairs are in close dialogue with one another, and they present their work with this relationship in mind. Others have chosen to make work that stands on its own. Through the show’s hanging, Juarez encourages new and surprising associations within this artistic community to emerge. Introductions opens on March 17th from 6-8 PM, and runs through April 10th. Gallery hours are Wednesday to Sunday, 1-7 PM, or by appointment. OnApril 2nd from 5-7 PM, there will be a screening and reading featuring works by Jared Buckhiester, Angela Conant, Nic Freberg Morgan, and Derek Stroup. Roberto Juarez, curator of Introductions, sat down with us to answer 6 questions about this diverse group of artists, balancing art work, and his long history at La MaMa! For Introductions, Juarez and eight of his colleagues will each introduce an artist of their choosing to the gallery. The show focuses on visual and spatial conversations between artists working at different stages of their careers, and through this contrast mixes genres and ideas. Some of the artist pairs are in close dialogue with one another, and they present their work with this relationship in mind. Others have chosen to make work that stands on its own. Through the show’s hanging, Juarez encourages new and surprising associations within this artistic community to emerge. 1. Introductions has such a diverse mix of artists. How did you come to pick the nine "choosing" artists? It happened kind of organically, as I started looking around at artists I knew from my career in New York. I realized there was a rationale to staying in the neighborhood, so I chose people who had worked in the Lower East Side, shown in the Lower East Side, were somehow involved in this downtown community from the 80s on. 2. What kind of relationships are there between the artist pairs? I believe some of them are students, some are friends, and some are assistants that actually work with the artists on a technical level. 3. Did you have a strategy going into install, as far as how to balance all of the works? In a way, it hung itself. Some things needed to be next to their presenter, as there was already a working relationship with what they were submitting. Some pieces were on their own and could be moved around. These works started conversations between works that I hadn’t seen together before, like between Nic Freberg Morgan and Barbara Takenaga, in which there’s an interesting relationship between their subject matter and how they approach their surfaces. 4. Whose work is the most different now, versus what you first saw in their studio? What was the most surprising thing you observed in these visits? Probably Devon Rodriguez. He didn’t have the painting Broadway-Lafayette yet, it’s a new work that was completed right before the opening. We talked about his subway paintings as something I was interested in, but he didn’t have any. So he made me one, and I love it! Most surprising was my visit to Charlotte Becket’s studio. It’s in deep Brooklyn, and just finding it was a journey. Once I arrived, I was rewarded with the incredibly intricate and gorgeous structures that she was making, before she covered them with black latex. To see her drawings and her working method was important in understanding her process and her work. 5. You're including your own work as well. Can you talk a little about it? This winter I did a residency at Anderson Ranch in Snowmass, Colorado, and I was paired with a digital printer from Boston named Jonathan Singer to make mixed media works. I took my daily calendar drawings, which are small paper pad works, and scanned them into the computer. I blew them up in scale, and painted under and around them to make these new mixed media works. 6. What does working at La MaMa mean to you? It means a lot, because it was where I started my life as a professional artist. When I first moved to New York I was offered a show at a prestigious Manhattan gallery, but I didn’t have a studio. Ellen Stewart offered me the original La MaMa Galleria space to paint in, for free. She said that she wanted to bring some art energy into Lucky Star garage, and that if I cleaned it up I could use it. There was no water, no lights, it was a pile of bricks and sand that I had to clean out. Mark Tambella connected me to an extension cord, so that I could have some clamp lights, and I used a neighbor’s cold water spigot for my brushes. I appreciate it to this day, and I’ll do anything for La MaMa Galleria to support them and their mission in this community.